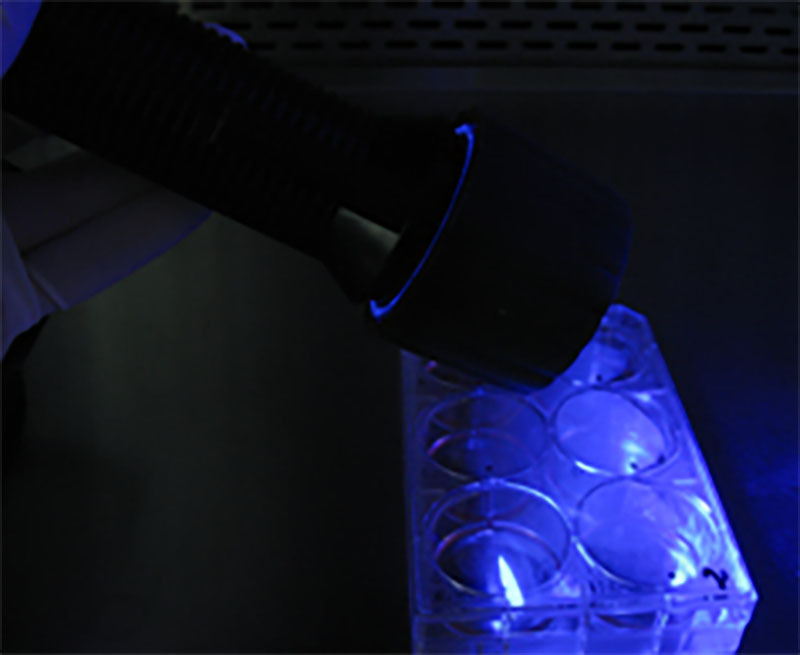 We are occasionally asked about using the NIGHTSEA tools to check bacterial or cell cultures expressing GFP or other fluorophores. This has been done successfully. The informal report below was sent by a researcher trying out the BlueStar flashlight at a time before the Stereo Microscope Fluorescence Adapter was even a product. Now you can use NIGHTSEA gear to work at both the overview and detail levels. And if you have more than one color fluorophore you can also take advantage of the Dual Fluorescent Protein flashlight series. 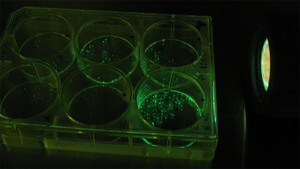 Project: Cell culture for in vitro transfection of NS20Y mouse cells with a construct that also expresses GFP. 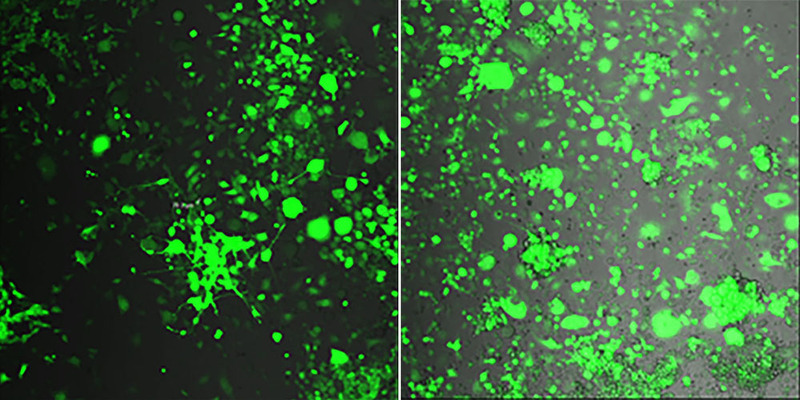 Problem: I wanted to know 1) if my transfection was successful, and 2) I wanted to be able to track puromycin selection of GFP positive cells over a few weeks without having to take my cells to the core to see them under the fluorescent microscope every time. Conclusion: For a quick, qualitative assessment of success rate of transfection, the NIGHTSEA flashlight worked great. 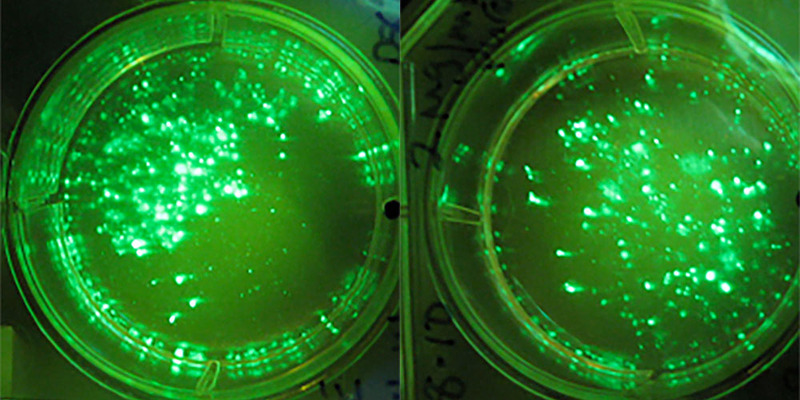 It also worked for tracking the increase in GFP positive cells over the time course of antibiotic selection (Fig 3). It is purely qualitative though. 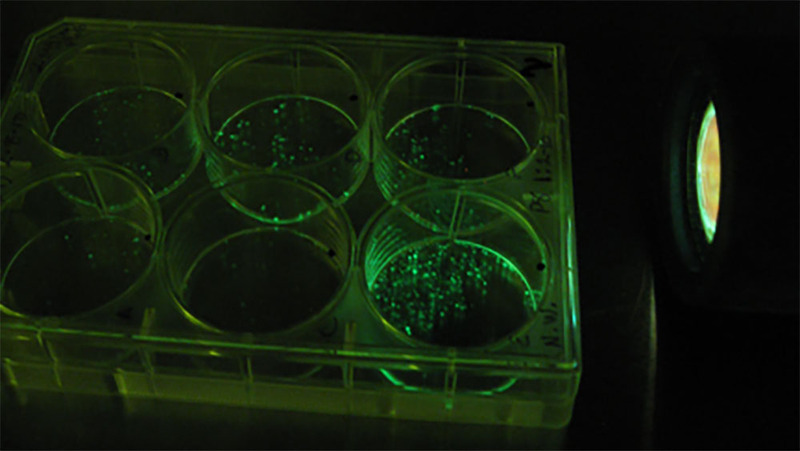 Using the flashlight, I actually thought I had a high number of puromycin resistant cells that were not GFP positive, but this was not the case. 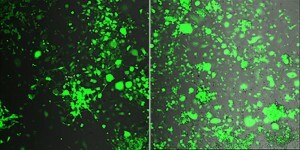 Once I looked at the cells under the microscope with a much higher intensity, I could confirm that most all my cells were indeed GFP positive (Fig 4). So I think the flashlight only picks up the highest fluorescing cells. For the cost and convenience, it is entirely worth it! The flashlight can also be used in the tissue culture hood to pick GFP positive cells to accelerate the cell selection process.